Groth, a trailblazing and celebrated composer for the crime fiction drama genre Nordic Noir, shares his time between Denmark and Los Angeles. Driven by Groth's vision, Nordic Noir L.A., his first concert in L.A., will take the audience on a sonic journey across the stylishly dark genre, premiering renditions from lauded scores like, The Girl With The Dragon Tattoo, the TV series' 'Dead Man Down', 'Unforgettable,' 'Skintrade,' and others. The Nordic Noir sound is defined by beautiful esoteric moods and tones cultivated through the evocative use of dark orchestral sounds and gripping music. Jacob Groth is a longtime supporter of urban wildlife and Griffith Park, and a frequent visitor to the Park. 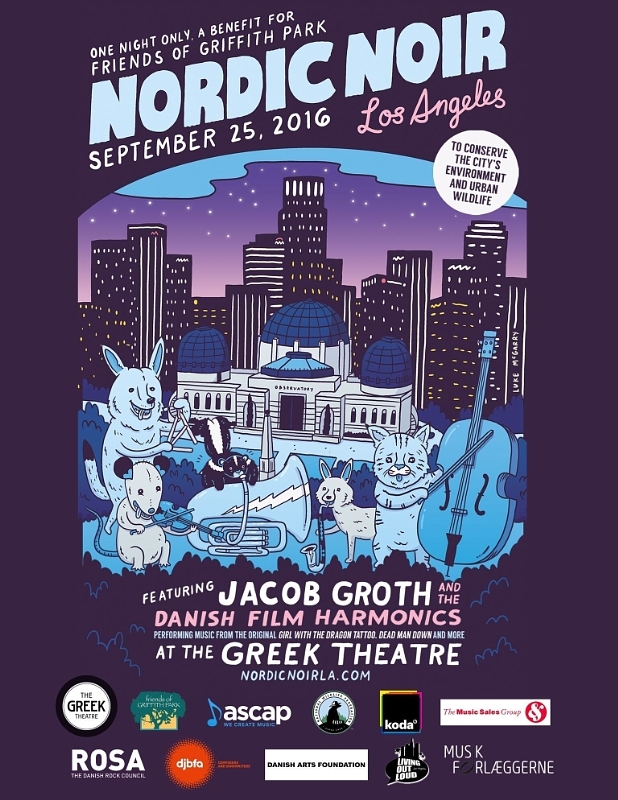 On September 25, 2016 renowned film composer Jacob Groth (Stieg Larsson's Millennium trilogy - 'The Girl With The Dragon Tattoo,' 'The Girl Who Kicked The Hornet's Nest' and 'The Girl Who Played With Fire') and the Danish Film Harmonics Orchestra will headline a special benefit concert for Friends of Griffith Park at Los Angeles' Greek Theatre. 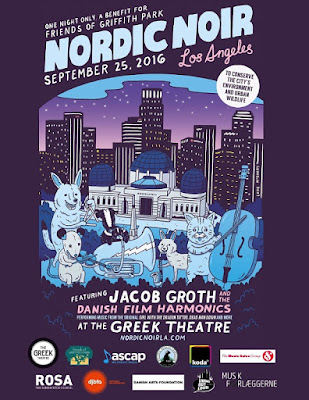 The concert, Nordic Noir LA: A Benefit Concert for Friends of Griffith Park, begins at 8:00 p.m. (VIP option is earlier). The Greek Theatre, which is part of Griffith Park, is located at 2700 N. Vermont Ave., Los Angeles CA 90027. Groth, a trailblazing and celebrated composer for the crime fiction drama genre Nordic Noir, shares his time between Denmark and Los Angeles. Driven by Groth's vision, Nordic Noir L.A., his first concert in L.A., will take the audience on a sonic journey across the stylishly dark genre, premiering renditions from lauded scores like, The Girl With The Dragon Tattoo, the TV series' 'Dead Man Down', 'Unforgettable,' 'Skintrade,' and others. The Nordic Noir sound is defined by beautiful esoteric moods and tones cultivated through the evocative use of dark orchestral sounds and gripping music. Jacob Groth is a longtime supporter of urban wildlife and Griffith Park, and a frequent visitor to the Park. One of Griffith Park's most famous wildlife residents, Los Angeles' "celebrity" mountain lion, P-22, was first captured in 2012 by cameras belonging to the Griffith Park Natural History Survey's Connectivity Study, one of many scientific studies funded largely by Friends of Griffith Park. These were the first known photographs of a mountain lion east of the CA-101 Hollywood Freeway/Cahuenga Pass within the Santa Monica Mountains eco-region. The Griffith Park Connectivity Study is the first project to evaluate the movement of wide-ranging mammals through potential corridors that may connect Griffith Park and its vicinity to neighboring natural areas. The Study documented P22, but California Fish & Wildlife and the National Park Service made the decision to radio-collar the mountain lion to monitor his activity in the Griffith Park area. In addition to P-22, the Study has recorded to date, bobcat (Lynx rufus), coyote (Canis latrans), mule deer (Odocoileus hemionus), raccoon (Procyon lotor), and striped skunk (Mephitis mephitis), among others. Various species have been documented crossing the Hollywood Freeway on overpass bridges. As one of many scientific studies funded by Friends of Griffith Park that explore the biodiverse flora and fauna of the Park, the organization hopes that information from the Study will be used to identify valuable wildlife corridors and to inform stakeholders on how to better facilitate wildlife movement to and from Griffith Park, and to expand that knowledge to other fragmented urban areas. "Performing my film-music at the Greek Theatre in Griffith Park is a dream come true for me," said Groth. "The idea of combining this artistic vision with my passion for supporting urban wildlife and Griffith Park has been in my mind for a while now. Once I met with the Friends of Griffith Park team I knew we could make it happen and I'm extremely happy that it has finally become a reality!" Gerry Hans, President of Friends of Griffith Park, added, "We are thrilled to join forces with world-class talent Jacob Groth for this incredible benefit concert. We hope this extraordinary night of music and culture will inspire and motivate others to join our cause and become more active caretakers of our beloved park and its endangered biodiversity." The evening promises to combine the best of Nordic culture with the best of Los Angeles including unforgettable music, delectable cuisine, and education benefitting the stewardship of one of Los Angeles'most beloved open and natural spaces. The event is generously sponsored by ASCAP (American Society of Composers, Authors and Publishers), National Wildlife Foundation, Danish Arts Council, KODA (Danish Society of Composers, Authors and Publishers) Living Out Loud Magazine, Musik Forlaegerne, DJBFA and ROSA (Musical-political organization that supports Danish music through grants from the Music Act) and the Greek Theatre. 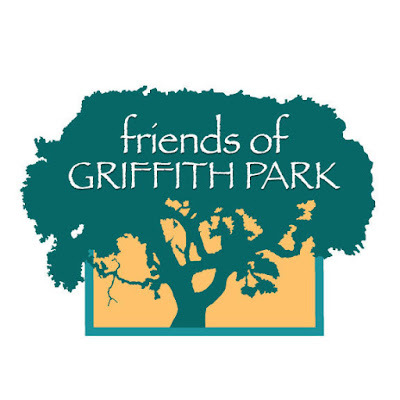 Friends of Griffith Park (FoGP) is a non-profit 501(c)(3) group dedicated to preserving and protecting Griffith Park's natural habitat, biodiversity and historic features for our generation and future generations to enjoy. FoGP promotes knowledge about the natural and human history of the Park, Los Angeles' largest Historic-Cultural Monument. "It must be a place of recreation and rest for the masses, a resort of rank and file, for the plain people. I consider it my obligation to make Los Angeles a happier, cleaner and finer city." FoGP continues to share the Colonel's insightful views, and honor his farsighted vision by ensuring the Park remain a special oasis for Angelenos and visitors to reconnect with nature. The organization believes that now, more than ever, it is critical that we protect this Park, the largest urban Park in the country. Friends of Griffith Park is committed to ensuring that Griffith Park remain open, natural, and free to all citizens of Los Angeles. Danish composer Jacob Groth is the music mastermind behind "The Girl With The Dragon Tattoo", "The Girl Who Kicked The Hornet's Nest," and "The Girl Who Played With Fire", the critically acclaimed movies of The Millennium Trilogy, based upon the world wide bestselling crime novels by Swedish writer, Stieg Larsson. With the release of the Millennium movies, Groth successfully transitioned from the intimacy of the Nordic film and TV screen to the international cinematic scope. In Hollywood, Groth released the feature film "Dead Man Down" as well as 33 episodes of the CBS network TV series "Unforgettable." Groth is a five-time EMMY winner; a recipient of the ASCAP Award in 2012 for best score ("Unforgettable" - Sony), and has received numerous other accolades. His music exudes a special haunting atmosphere that captivates audiences on and off the screen. Groth's scores are rich in Nordic cool and full of melodic grace and alluring enigmas.